Towards the close of 2017 we built these wooden balau stairs in Blythdale Beach, KZN. The original treads had been made of 19 x 68mm balau deck boards. Because the spacing between the stringers was 1m the stairs were very springy and were bouncing. The general rule is that a 19mm thick piece of balau can be spanned a maximum of 500mm before it needs to be supported by a bearer of sorts. In the case of open riser stairs this is often not possible because one would need a third stringer that would need to be notched to accommodate the tread. As such when we build stairs using balau that are normally 1m wide we increase the thickness of the balau to 30mm which stops any bounce. 40mm can also be used but is really just a waste of wood and therefore money. The original balau stair treads were installed in 1997. The way the treads had been made up was to attach a cleat to the underside of each tread at the ends. The cleat was screwed from below to the treads (deck boards) and then the whole tread in its complete form was fixed to the steel cleats which were welded to the steel stringers. A bolt had been used to secure them from the top through all the timber and steel with a nut below. Water had therefore been able to penetrate the balau from the top where the bolt hole had been drilled and this, over a 20 year period of time had caused the balau to rot at the bolt hole. Then rest of the treads were in perfect condition with no rot whatsoever, 20 years down the line. Not all balau behaves that way. The balau that was used was obviously of very good quality. Nowadays the quality varies a bit more but balau still remains the most cost-effective hardwood for outdoor applications, be it decking, pergolas or screens. To avoid the same fate of rotting at the bolt hole we fixed the entire tread in its made up form from below with a stainless steel coach screw instead of a nut and bolt all the way through the timber. As such the only way water can penetrate the timber now is from below which is highly unlikely. Water can still get trapped between the timber cleat and the timber treads but with no end grain to penetrate it should give us more than 20 years of life. 99% of water ingress is absorbed through the end grain of wood and not the face grain. By drilling holes, especially from the top, one exposes a section of end grain and water sits in the hole and gets absorbed. As a precautionary measure when we build sun decks and have to drill from the top to fix our board to the bearer we fill the screw hole with epoxy to keep the water out. There are other hidden fixing methods but I am yet to find one that works the way it was intended to. Deck boards screwed from the top through the face and filled with epoxy remains the strongest and long lasting method. But it is vital to check the epoxy plugs at maintenance intervals and replace if necessary. In the case of these stairs drilling from below into a 30mm piece of balau was ample fixing strength and reduces water ingress. These balau stair treads we pre -oiled before installation which made it quicker and easier to get them installed. 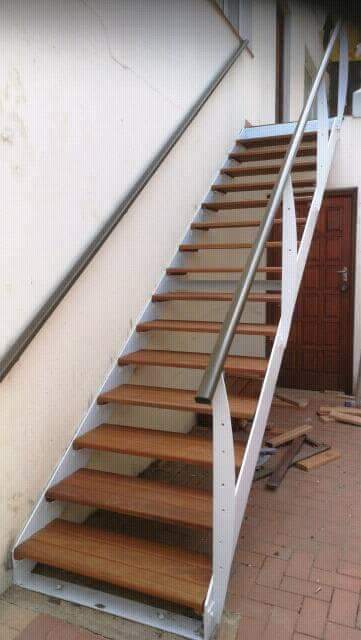 For a free no obligation quote on timber decking, stairs, pergolas, balustrade and any other outdoor timber project, please contact us on 031- 762 1795 or use the contact us form below.